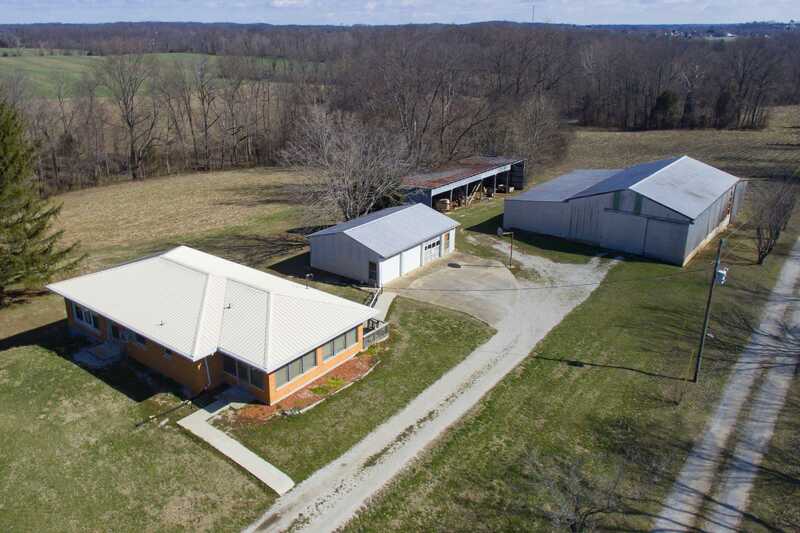 Roudenbush Farm Auction — Harritt Group, Inc.
Prime 22 Acre Floyd County farm family owned since 1960’s including mid-century ranch home with basement, detached 3-car garage, pole barn & implement barn selling in 2 tracts using the multi-par method located just 9 miles west of I-64 Hwy. 150 Greenville Exit. Also selling farm equipment, antiques, collectibles & household items. Open & lightly wooded tract with 247’ frontage surrounds 1276 square foot ranch with full walkout basement, 24’x36’ detached 3-car garage, 34’x 60’’ pole barn with lean to’s and 24’x76’ implement barn. Home built in 1964 features 3 bedrooms, 2 baths, eat-in kitchen, hardwood floors, 12’x24’ enclosed porch, partially finished walkout basement, 8’x8’ wood deck & metal roof. Open & tillable tract, lightly wooded with 179’ frontage. Buyer to assume Spring 2017 taxes due 2018. Possession immediate. Selling as is with no contingencies. All inspections welcomed prior to auction. 3-point plow, boom & scoop, harrow, auger & farm wagons, chain saw sharpener, scaffolding, galvanized feed tank, Highlift farm jack, portable 6’x8’ greenhouse new-in-box, fuel tank, ½ ton hoist, metal storage cabinet, bales of hay, scrap metal and remaining contents of barns. I-64 to Hwy. 150 Greenville Exit 119. West 9 miles to left on Kiesler Road. 8/10 mile to auction on left.